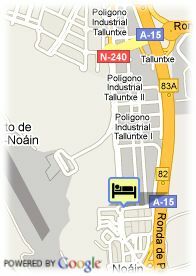 Real, S/N, 31110 Pamplona, Spanje. 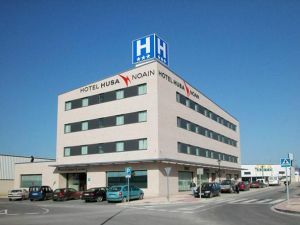 Hotel Husa Noain is located at 1km from the airport and 5 minutes from Pamplona. The hospital zone, university campus and a shopping mall and leisure centre are within 3 minutes. There is a permanent public bus connecting the hotel with the city centre. It has a 60 light, fully equipped exterior rooms, with air-conditioning, sound-proofing, satellite TV, telephone and free WI-FI Internet connection. There is a cafeteria restaurant also, called 99, featuring a private dining room, which can be reserved for business meals, and a main dining room, which provides a daily set menu. A meeting / banquet room and a car park within the building, are also available. Betalende overdekte parking aan het hotel (11.24 €).